Narsarsukite: Mineral information, data and localities. Walking to the Narssarssuk pegmatite. Named for the type locality. Visit gemdat.org for gemological information about Narsarsukite. Aegirine 6 photos of Narsarsukite associated with Aegirine on mindat.org. Quartz 5 photos of Narsarsukite associated with Quartz on mindat.org. Leucosphenite 4 photos of Narsarsukite associated with Leucosphenite on mindat.org. Manganoneptunite 3 photos of Narsarsukite associated with Manganoneptunite on mindat.org. Elpidite 3 photos of Narsarsukite associated with Elpidite on mindat.org. Pectolite 3 photos of Narsarsukite associated with Pectolite on mindat.org. Microcline 2 photos of Narsarsukite associated with Microcline on mindat.org. Magnesio-arfvedsonite 1 photo of Narsarsukite associated with Magnesio-arfvedsonite on mindat.org. 9.DJ.20 Seidite-(Ce) Na4(Ce,Sr)2Ti[(O,OH,F)5|Si8O18(OH)] · 5H2O Mon. 9.DJ.30 Jonesite Ba4(K,Na)2Ti4Al2(Si3O9)2(SiO4)4O2 · 6H2O Orth. Flink, G. (1899) Part I. 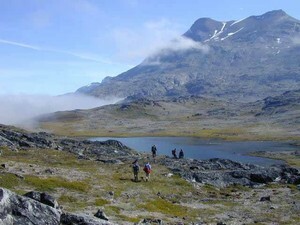 On the minerals from Narsarsuk on the Firth of Tunugdliarfik in Southern Greenland. 8-180, In: Flink, G., Bøggild, O.B., Winther, C. (1901) Undersøgelser af Mineraler fra Julianehaab indsamlet af G. Flink 1897, Part II. On some minerals from the Nepheline-Syenite at Julianehaab, Greenland (Epistolite, Britholite, Schizolite and Steenstrupite) Meddelelser om Grønland: 24: 1-213. Warren, B.E, Amberg, C.R. (1934) X-ray study of narsarsukite, Na2(TiFe)Si4O11. American Mineralogist: 19: 546-548. Graham, W.A.P. (1935) An occurrence of narsarsukite in Montana. American Mineralogist: 20: 598-601. Stewart, D.B. (1959) Narsarsukite from Sage Creek, Sweetgrass Hills, Montana. American Mineralogist: 44: 265-273. Jérémine, E., Christophe-Michel-Lévy, M. (1961) Un nouveau gisement de narsarsukite. Bulletin de la Société française de minéralogie et de cristallographie: 84: 191-194. Peacor, D.R., Buerger, M.J. (1962) The determination and refinement of the crystal structure of narsarsukite, Na2TiOSi4O10. 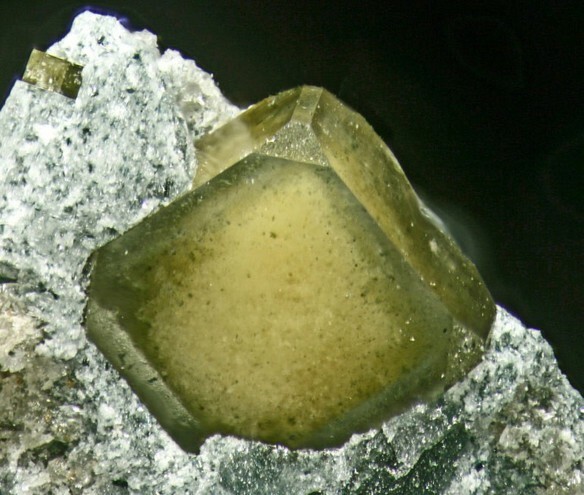 American Mineralogist: 47: 539-556. Pyatenko, Yu.A., Pudovkina, Z.V. (1961) Crystal structure of narsarsukite. Soviet Physics Crystallography: 5: 540-548. Rajasekaran, K.C. (1966) Narsarsukite from Mont St. Hilaire, Quebec, Canada. Canadian Mineralogist: 8: 506-514. Vlasov, K.A. Kuz'menko, M.V., Es'kova, E.M. (1966) The Lovozero alkali massif. Translated from USSR Acad. Sci. Press, Moscow, 1959, Edinburgh (Oliver & Boyd). Upton, B.G.J., MacDonald, R., Hill, P.G., Jefferies, B., Ford, C.E. (1976) Narsarsukite: a new occurrence in peralkaline trachyte, south Greenland. Mineralogical Magazine: 40: 737-746. Horváth, L., Gault, R.G. (1990) The mineralogy of Mont Saint Hilaire. Mineralogical Record: 21: 284-359. Wagner, C., Parodi, G.C., Semet, M., Robert, J.L., Berrahma, M., Velde, D. (1991) Crystal chemistry of narsarsukite. 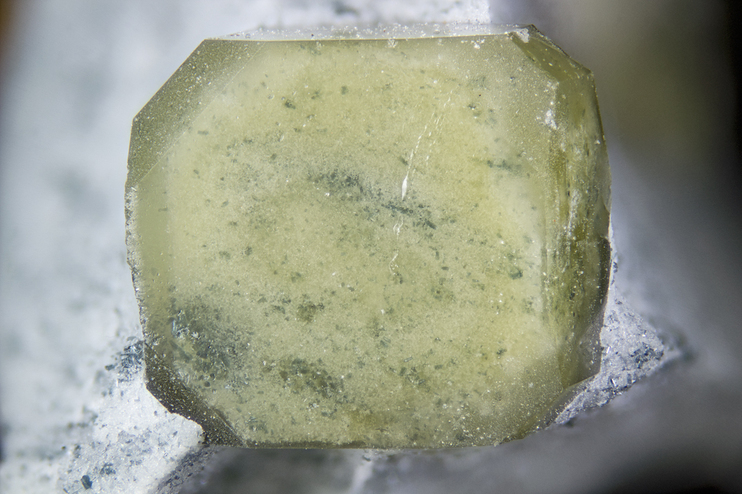 European Journal of Mineralogy: 3: 575-585 . Kartashov, P.M. (1994) Narsarsukite from fenitized rocks of Lovozero massif, Zapiski Vserossijskogo Mineralogicheskogo Obshchestva: 123(4): 58-66. Shannon, R.D., Shannon, R.C., Medenbach, O., Fischer, R.X. (2002) Refractive index and dispersion of flourides and oxides. Journal of Physical and Chemical Reference Data 31: 931-970. The following Narsarsukite specimens are currently listed for sale on minfind.com. Rajasekaran, K.C. (1966), Narsarsukite from Mont St. Hilaire, Quebec, Canada. Canadian Mineralogist: 8: 506-514; Chao, G.Y. (1967), Leucophanite, elpidite, narsarsukite from the Desourdy quarry, Mont St. Hilaire, Quebec. Canadian Mineralogist: 9: 286-87; Falls R.B. (1983), Elpidite and narsarsukite from Mont Saint-Hilaire, Quebec. B.S. Thesis, University of Toronto, Canada. 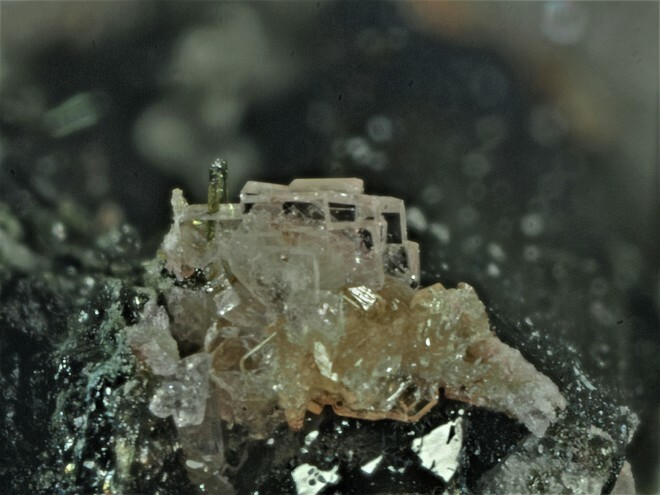 http://www.koeln.netsurf.de/~w.steffens/can.htm; Canadian Mineralogist Vol. 34, pp.349-371 (1996); A. Kerr and H. Rafuse (2012) Rare-earth element (REE) geochemistry of the Strange Lake deposits: Implications for resource estimation and metallogenic models. Newfoundland and Labrador Department of Natural Resources Current Research 2012 pp39-60; BIRKETT, T.C., MILLER, R.R., ROBERTS, A.C., & MARIANO, A.N. (1992) Zirconium bearing minerals from the Strange Lake intrusive complex, Quebec Labrador. Canadian Mineralogist, 30, 191-205. Upton, B.J.G. , Hill, P.G., Jefferies, B.,Ford and Macdonald, R. (1976): Narsarsukite: A New Occurrence in Peralkaline Trachyte, South Greenland. Mineralogical Magazine. 40 : 737-746. P.M. Kartashov data; Kovalenko, V. I., Yarmolyuk, V. V., Sal nikova, E. B., Kartashov, P. M., Kovach, V. P., Kozakov, I. K., ... & Yakovleva, S. Z. (2004). The Khaldzan-Buregtei Massif of peralkaline rare-metal igneous rocks: structure, geochronology, and geodynamic setting in the Caledonides of Western Mongolia. Petrology c/c of Petrologiia, 12(5), 412-436. Robin Tibbit collection (SXRD analysis by Uwe Kolitsch + EDS analysis by Franz Neuhold); Kolitsch, U., Blaß, G., Jahn, S., Cámara, F., von Bezing, L., Wartha, R. R., Tremmel, G., Sturla, M., Cerea, P., Skebo, M. and Ciriotti, M. E. (2016): Aris - mineralogy of the famous alkaline phonolite. AMI - Associazione Micromineralogica Italiana, Cremona, Italy, 95 pp. Pekov, I. (1998) Minerals First discovered on the territory of the former Soviet Union 369p. Ocean Pictures, Moscow; Zubkova, N. V., Pekov, I. V., Pushcharovsky, D. Y., & Chukanov, N. V. (2009). The crystal structure and refined formula of mountainite, KNa2Ca2 [Si8O19 (OH)]⊙ 6 H2O. Zeitschrift für Kristallographie, 224(8), 389-396. Graham, W.A.P. (1935) An occurrence of narsarsukite in Montana. American Mineralogist: 20: 598-601. Stewart, D.B. (1959) Narsarsukite from Sage Creek, Sweetgrass Hills, Montana. American Mineralogist: 44: 265-273.